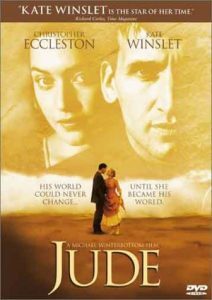 Jude is a 1996 British period drama film about a self-educated stonemason who enters into an illicit affair with his cousin, despite them both being married to other partners. The pair is condemned to the margins of society which results in a horrific tragedy. Michael Winterbottom (24 Hour Party People, Code 46) directs the film which is adapted by Hossein Amini (Drive, Snow White and the Huntsman) based on Thomas Hardy’s novel “Jude the Obscure”. Jude stars Christopher Eccleston (Fortitude, Doctor Who), Kate Winslet (Titanic, Divergent), Liam Cunningham (Game of Thrones, Safe House) and Rachel Griffiths (Blow, Saving, Mr. Banks). Jude filmed at Kent and East Sussex Railway where they filmed scenes of Jude (Christopher Eccleston) and Sue (Kate Winslet) on a train which was intercut with scenery from the North of England. Kent & East Sussex Railway is a ten and a half mile rural light period railway which runs between Tenterden and East Sussex. The railway has also been used for filming by productions such as Richard E. Grant on Ealing Comedies (2016), Last Passenger (2013) and Countrywise Kitchen (2011). Jude was released in October 1996 and is now available for DVD purchase. This entry was posted in Filmed in Kent and tagged Christopher Eccleston, feature film, Jude film locations, Kate Winslet, Kent and East Sussex Railway. Bookmark the permalink.